Hoooo-eeee. I just ate a lot of raw fish. And not only that, but a lot of weird raw fish, like fluke (blah) and really big salmon roe (yum) and sea urchin (really yum) and some kind of weird hard hamachi (throw up in my mouth). And I'm back at work now, and the consensus is...that I'm kinda high. In the running around really giddy and not lying to my boss when I said I just got back at 3 when I totally could have lied. Nobody believes me that it's just a raw fish high. Consensus is the waiter slipped some roofies into my wasabi. Not so, not so. Must focus. Yes! I want to show off what all that yarn has turned into! Or some of it anyway. 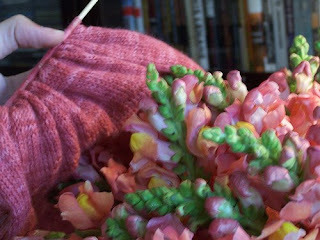 Baudelaire: (Knitpicks Bare, Rhubarb) Ah, you are lovely. You are a leeetle tight on my ankles because I disbelieved both Cookie A. and (apparently) the largeness of my ankle and didn't increase after the heel, but you are beautiful. And you match the flowers. Perditas: You are lovely. And I think--I hope--will be a thoughtful bridesmaid gift. 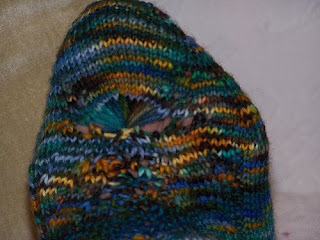 Because I'm outta time to knit anything else. 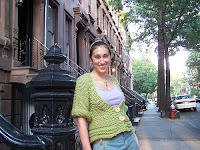 Belle Cardigan: (Rowan Big Wool) You are done. You are comfy. You were photographed by Toaster while neighbors looked on and laughed. Hence the very unattractive expression on my face. (On the left. Not below. Below is okay). Shorts Pajama Set: (Knitpicks Bare, Rhubarb). Nice flowers still. You are SO CLOSE to being done. If I could just sit still and read and knit, you could be done within the hour. Except for the sewing. And that's so not getting done today. 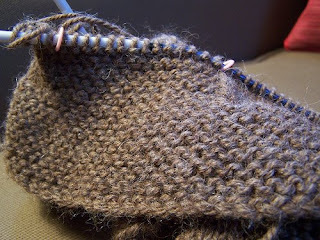 Wellfleet: (Knitpicks Bare, Cape Cod) You are socks that I am making for my mother. She has never been to Cape Cod, despite my urgings, and I dyed some yarn and am designing a pattern, and Mom, if you're reading this, Merry Christmas! Like the clam shell on the toe? 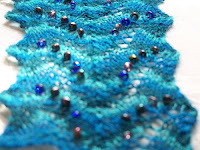 Cobblestone: You are a delight to knit. Your Berocco alpaca is soft, your pattern is incredibly simple but somehow still interesting, and I think you'll come out looking great (which is always encouraging). I'm just gonna go spin around in circles in my chair now.